Food poisoning cases double over the summer, so remember these simple steps to help keep food safe. Food poisoning is usually mild, and most people get better within a week. But sometimes it can be more severe, even deadly, so it’s important to take the risks seriously. Children, older people and those with weakened immune systems are particularly vulnerable to food poisoning. “The safest option is to cook food indoors using your oven,” says a spokesperson from the Food Standards Agency (FSA). “You can then put the cooked food outside on the barbecue for flavour.” This can be an easier option if you’re cooking for a lot of people at the same time. This is because raw or undercooked meat can contain germs that cause food poisoning, such as salmonella, E.coli and campylobacter. However, these germs can be killed by cooking meat until it is piping hot throughout. Some meat, such as steaks and joints of beef or lamb, can be served rare (not cooked in the middle) as long as the outside has been properly cooked. This will kill any bacteria that might be on the outside of the meat. However, food made from minced meat, such as sausages and burgers, must be cooked thoroughly all the way through. The Fire Service advises covering the bottom of your barbecue with coal to a depth of no more than 5cm (2in). 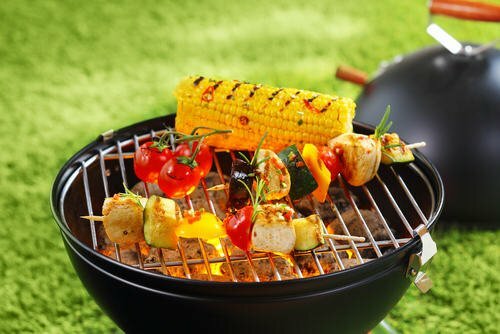 With charcoal barbecues, only use recognized fire lighters or starter fuel and only on cold coals – use the minimum necessary and never use petrol. See more on the Fire Service’s barbecue safety tips.